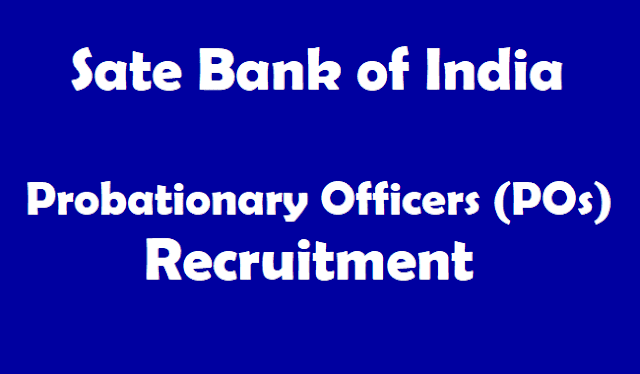 SBI POs /Probationary Officers Posts Recruitment 2018 Notification - Apply Online, State Bank of India, SBI has released the recruitment notification for this year's Probationary Officers POs Exam. All Eligible and Interested Candidates can apply online from 21st April 2018, to 13th May 2018. SBI POs/Probationary Officers Posts Recruitment 2018 Notification datails like important dates, eligibility, details of SBI PO vacancy for 2018 and how to apply online given below. Please note that the official notification is now available on sbi.co.in/careers. As per the 2018 notification released by SBI, the starting basic pay for SBI PO is Rs. 27,620/- (with 4 advance increments) in the scale of Rs.23700-980/7-30560-1145/2-32850-1310/7-42020. The scale is as applicable to Junior Management Grade Scale-I. Also, the selected candidates would be eligible for a DA, HRA and other benefits as decided by the bank from time to time. The overall CTC for SBI PO, depending on the city where the candidates are posted, comes to about 8.20 lakhs to 13.08 lakhs per annum. SBI POs 2018 How to Apply? How to apply for SBI POs Recruitment 2018: Candidates interested in applying for SBI PO 2018 are required to fill the online application form. The forms are available on the official website. Direct Link to the same is also provided here. Candidates would be required to pay a fee of Rs 600 (for general category) and Rs. 100 for reserved category. Also, candidates would be required to upload their signature and photograph. These details are provided on the official notification available. Candidates interested in applying are advised to please go through the official notification carefully before filling the online application form. In order to apply, interested candidates can click on the Online Application Form for SBI PO 2018. A new window would open. Candidates are required to register online on the page and provide the information. Please remember, application would be considered complete once the fee is deposited. Also, candidates can only fill the online application and are required to pay the fee through online mode. Fee would not be accepted through challan. Phase-I: Examination consisting Objective Tests for 200 marks and Descriptive Test for 50 marks. The Objective Test will be online. Immediately after the online Objective Test, Descriptive Test will be administered. Questions relating to Descriptive Test will be available on computer (Online) and candidates will have to write the answers on the answer sheet (Offline) provided to them on Paper/Pen mode.